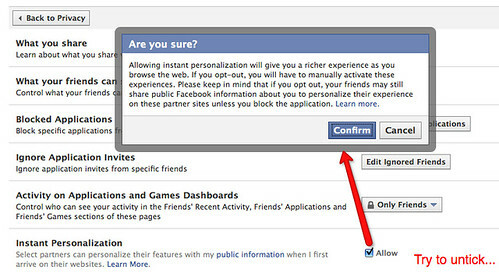 If folk think they have set their privacy setting one way, but they operate in another through the myriad interactions of the different settings, users may find that the images and updates they think they are posting into a closed garden, are in fact being made public in other ways, whether by the actions of their friends, applications they have installed, pages they have connected to, or websites they visit. 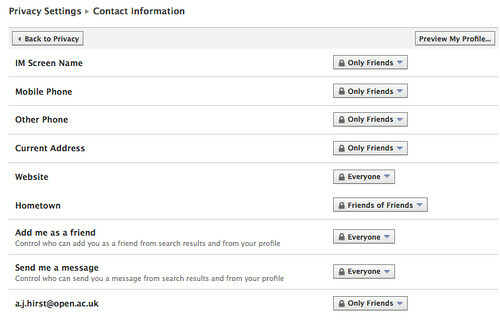 The Facebook privacy settings also seem to me to suggest various asymmetries. For example, if think I am only sharing videos with friends, then if those friends can also share on content because of the way I have set/not changed the default on another setting, I may be publishing content in a way that was not intended. It seems to me that Facebook is set up to devolve trust to the edge of my network – I publish to the edge of the my network, for example, but the people or pages on the edge of my network can then push the content out further. 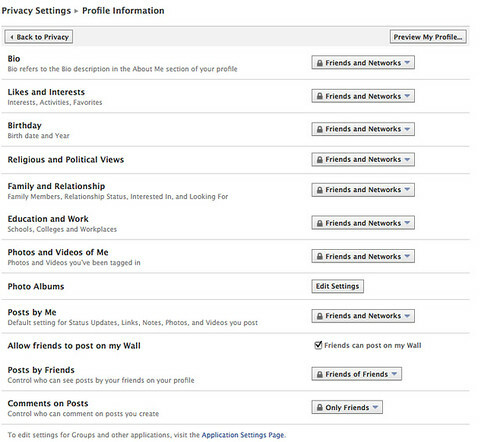 The privacy settings around how friends can share on content I have shared with them is also confusing – do their privacy settings override mine on content I have published to them? This contrasts with a view of each object having a privacy setting, and that by publishing an object, the publisher controls that setting. So for example, I could publish an object and say it could only be seen by friends of me, and that setting would stick with the object. If you treid to republish it, it could only be repulshed to your friends who are also my friends. My privacy settings would set the scope, or maximum reach, of your republication of it. Regular readers will know I’ve started looking at ways of visualising Facebook networks using Gephi. 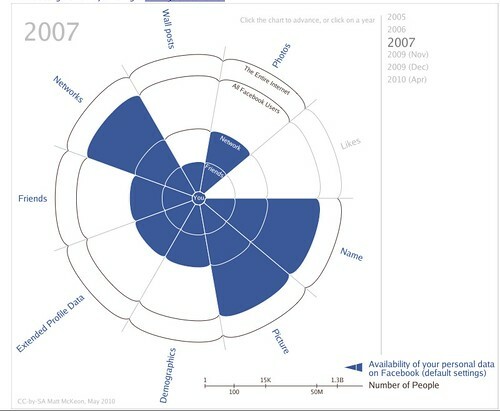 What I’m starting to think is that Facebook should offer a visualisation of the furthest reach of a person’s data, videos, images, updates, etc, given their current privacy settings (or preview changes to that reach if they want to test out new privacy settings. Follow it, and decide whether you like what you see. You do know who your friends are, don’t you, and you do know who they know? And where they go? And what applications they have installed? Becuase my reading of the above is that they can share information you shared with them to all those people, whether you approve or not? 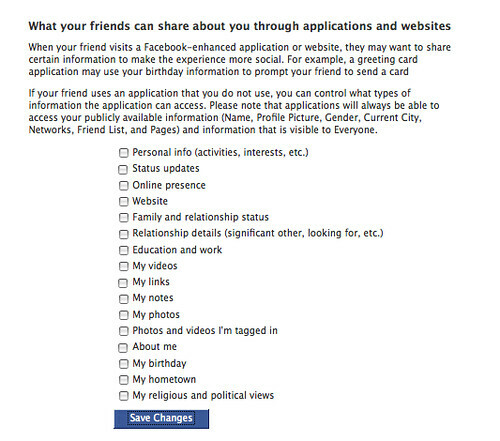 Or maybe I just misunderstand the permissions granted by the above form in the weird and wacky game of Top Trumps that is the Facebook privacy environment. Maybe the permissions you set to only share photos and videos with friends trumps the settings that let friends share your photos and videos with applications and sites they visit. Or maybe they don’t? Does anyone know for certain…?! 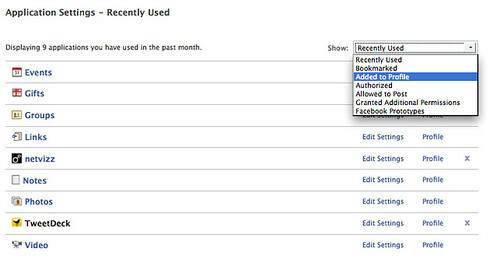 This page is not easy to find from the under the privacy settings, but can be reached from the Facebook Account menu, under Application Settings. 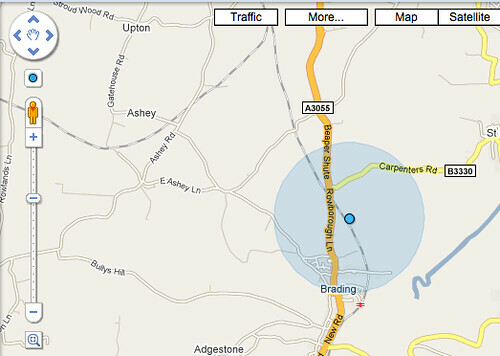 If you’re using a mobile phone, additional cues ares available, such as a GPS fix if your phone is GPS enabled, and cell tower triangulation, where the phone’s location can be detected not only from the current cell the phone is registered with, but also from the signal strength of surrounding cells. 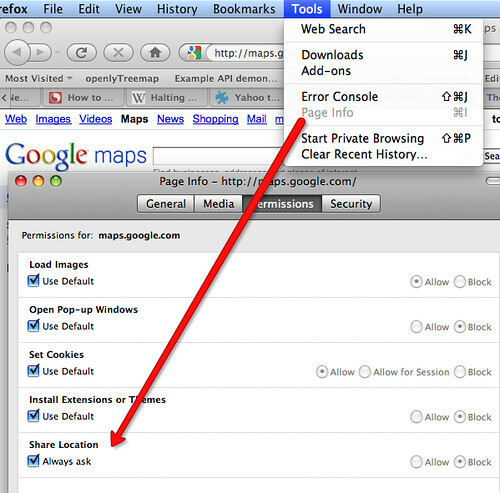 There are several ways for Google to do this, of course…. If you have an Android phone, then it’s in principle possible for the phone to reconcile GPS data with cell tower and wifi network identifers and signal strengths. And the Google Streetview car? Well it appears that it doesn’t just collect imagery… On Google Street View Car Logging Wifi Networks: “Google’s roving Street View spycam may blur your face, but it’s got your number. The Street View service is under fire in Germany for scanning private WLAN networks, and recording users’ unique Mac (Media Access Control) addresses, as the car trundles along.” In the past, of course, there have also been privacy concerns about Google Street View capturing faces and car number plates. (See also: Large-scale Privacy Protection in Google Street View [PDF]). See also: So What Do You Think You’re Doing, Sonny? Although on a day to day basis I’m a Mac user, every so often I need to dip into the Windows virtual machine on my laptop. This generally fills me with fear and trepidation, because as an infrequent Windows user, whenever I do go over to the dark side I know my internet connection will grind to a halt and I will get regular requests to restart the machine as Windows goes into update mode. In a similar vein, on a day to day basis it’s Twitter that meets my social web needs. But on the rare occasions I go into Facebook, I’m also filled with dread. Why? Because there is frequently a new privacy minefield to negotiate (e.g. 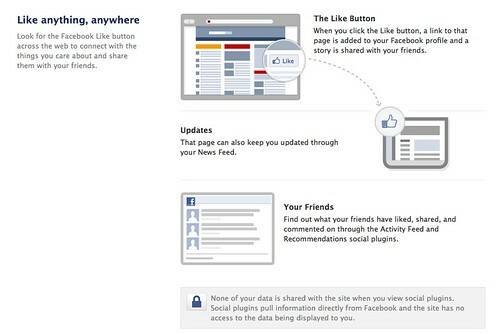 Keeping Your Facebook Updates Private). So Facebook makes it easy for website owners to help you “tweet” a link to your Facebook stream… (I wonder, does this also work as a social bookmarking service? Can I browse through the links I’ve Liked? Ah – according to Deceiving Users with the Facebook Like Button, it appears that “Removing the feed item from your newsfeed does not remove your like — it stays in your profile. You have to click the button again to remove the ‘Like’ relationship.” So it could be used as a social bookmarking service, of a sort. Or at least a Facebook equivalent to “favorited” websites in your browser. So, what other goodness (?!) does Facebook have in store for us? Am I sure…? Err, yes… Confirm. But what does this mean…? Hmmm, I think I’ll Learn More… (do you ever get the feeling you’ve ended up in one of those Create Your Own Adventure style games, only for real… Is this Brazil, or a Trial? 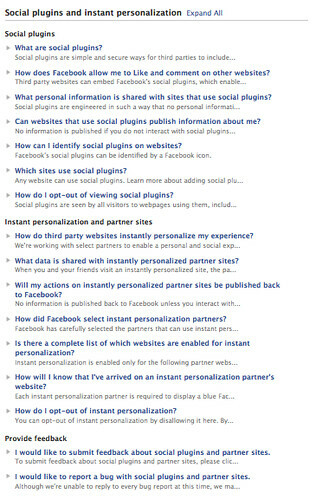 What data is shared with instantly personalized partner sites? Or is that “When you or your friends visit…”? That is, if my friend visits Pandora and goes for instant personalisation, can Pandora use my friend as a vector to grab my public information? A question that now follows is – can Pandora identify my Facebook identity through some mechanism or other (e.g. Facebook set cookies?) and reconcile that with what it has learned about me from my friends who have opted in to personlisation features. And if so, could it then offer me personalisation services anyway, even though I opted out on Facebook…? 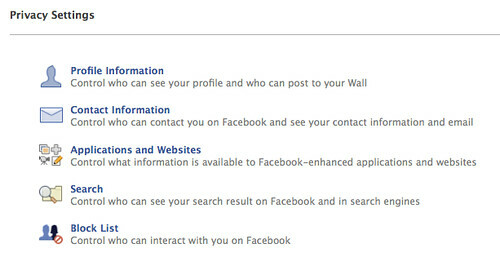 Hmmm… there’s a link there to Application Settings, which I don’t think appears on the Privacy settings page. Where does it go? I’m not sure I understand everything in that drop down menu…? How about the Contact settings? So… if i don’t take steps to protect my information, then my friends can give access to my presence, videos, links, photos, videos and photos and tagged in, my birthday, hometown etc etc to third party applications? 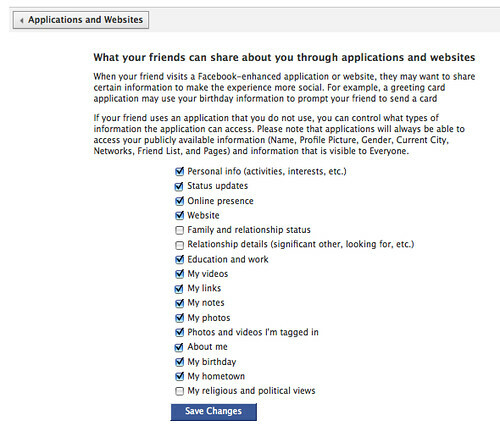 Does that mean if I have various privacy settings set to share with friends only, they can still share the information on to third parties I did not anticipate seeing the data? In the following set up, who can see photos and videos of me? A short and sweet blog post this one… if you want to share a list of posts by tag or category, or the results from a search on a WordPress blog in the order in which they were posted, just add ?orderby=ID&order=ASC to the end of the URL. * orderby=menu_order Note: Only works with Pages. * orderby=meta_value Note: A meta_key=keyname must also be present in the query. Prompted by a DevCSI Developer Focus Group conference call just now, I had a quick look through the list of Bounty competition entries (and the winners to see whether there was any code that that might be fun to play with. And here are links to the history of the current Labour Party and Conservative Party domains: The animated history of: http://www.labour.org.uk/ and The animated history of: http://www.conservatives.com/. The app will also animate changes from a MediaWiki wiki as this link demonstrates: Dev8D wiki changes over time. The Dev8D pages also suggest a “Web Diff” app was entered in one of the challenges, but I couldn’t see a link to the app anywhere?